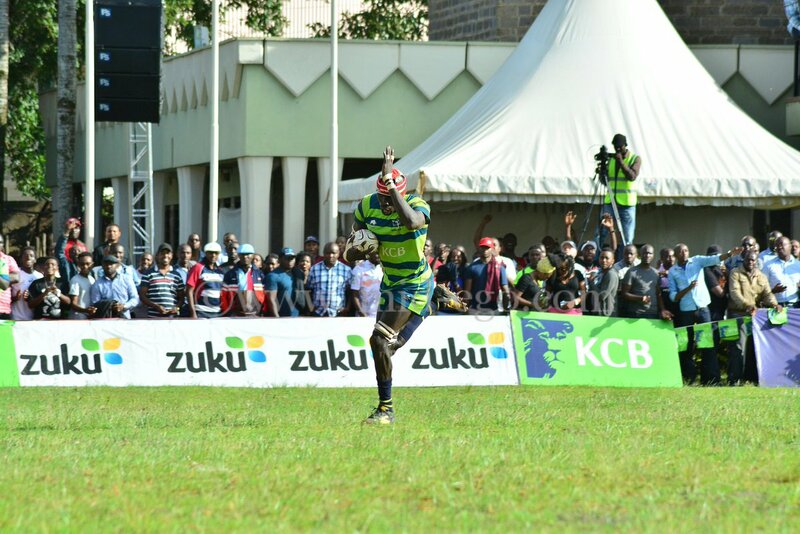 KCB reclaimed the Kenya Cup title with a comprehensive 36-8 victory over defending champions Kabras Sugar at the KCB Sports Club on Saturday 22 April 2017. Darwin Mukidza drilled home a penalty to give KCB a 3-0 lead over combining with Andrew Amonde to set up Jacob Ojee’s try. Oliver Mang’eni would pounce on the loose ball off Duncan Mwangi’s fumble, touching down under the posts with Mukidza converting for a 15-0 score. Kabras would attempt to get into game, their efforts eventually paying off when Philip Wokorach stroked home a penalty for a 15 -3 score. Wokorach would moments later make a try saving tackle on Mike Wanjala after the KCB scrum half had beaten the Kabras defenders with a cheeky darting run. With half time looming, with Kabras having spurned possession and territory, Mukidza scored and converted for a 22-3 lead at the break. Kabras would start strongly after the break and were rewarded through Wokorach’s unconverted try, the champions sensing a lifeline with 37 or so second half minutes to play for. Peter Karia, on as a second half substitute for George Asin, landed the game’s fourth try, scoring off the rolling maul,Mukidza sure with the twos for a 29-8 score.